Spanning decades and entwining stories, The Lake House hooks you from the very beginning and transports you to Loeanneth; family estate of the Edevane's and home to a mystery that has remained unsolved for many, many years. When police detective, Sadie Sparrow, finds herself on an enforced break from the police force, she leaves London with Cornwall and her granddad, Bertie, in her sights. Twiddling her thumbs, and wiling away the days isn't something Sadie takes to easily, and whilst out running in the nearby landscape she stumbles across Loeanneth; a beautiful but abandoned country home. Sadie soon learns of the history and mystery surrounding Loeanneth, and gets stuck in to a new investigation. Back in London, crime writer Alice Edevane is working on her newest detective novel, when a letter from Sadie Sparrow draws the author back into a time she had long since been trying to distance herself from. The unfolding story is told in both past (1930's) and present (2003) with a third person narration, however the chapters are told from varying view points with each character having a distinct and clear voice. I think the story telling method worked well here, with potential discoveries and revelations soon being addressed with a look back in time. As I mentioned above, each character has a distinct and clear voice, as well as having a believable backstory and personality - I like realistic characters, individual traits, people with flaws, and that's how the characters are written in The Lake House. As well being well written, I felt a connection with the characters and cared for them; wanting conclusions and empathising in certain situations. There are a couple of themes running through The Lake House, with the main one being the loss of a child, which is highlighted in a number of ways through different plot points. The nature of this subject, and others that are touched upon, make for an emotional read although I didn't find the story to be a tear jerker. Plot wise, a fair bit is going on within The Lake House, my copy being nearly 600 pages long, however I never once felt lost, with the story flowing smoothly and being perfectly paced coming together in an ending I didn't quite see coming. Whilst there is a lot to cover in the plot, I think another reason why the story runs so long is because of Kate Morton's wonderful use of description. I know this style of writing puts off a lot of people, however done right I think it pulls a story together nicely, offering an immersive reading experience, which proved to be the case here. I had such an enjoyable reading experience of The Lake House; meeting the characters, visiting Cornwall and Loeanneth, piecing together the puzzle, and most importantly, returning to the writing of Kate Morton. This was the second book of Kate Morton's that I've read, and I'm super excited to delve into more of her backlist. 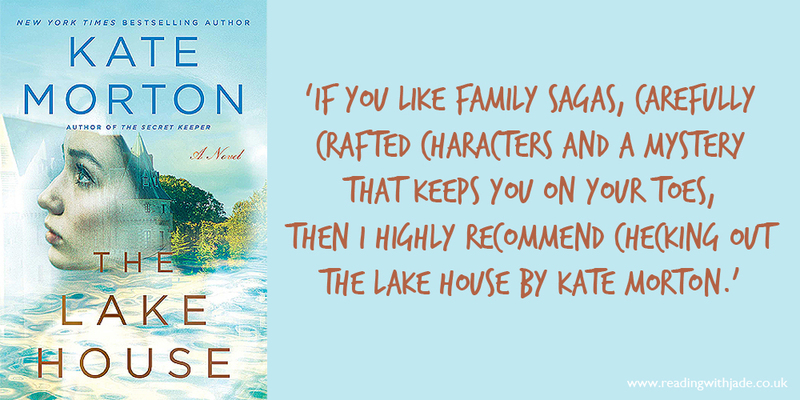 If you like family sagas, carefully crafted characters and a mystery that keeps you on your toes, then I highly recommend checking out The Lake House by Kate Morton. Great review. I'm glad you enjoyed this one. It's one I've had on my list and have been waiting for the mood to strike. I hope you enjoy this one when you're in the right reading mood - I think it could make great summer reading. I hadn't realized there was a police detective in this one! Morton's stories tend to have a bit of a mystery, but not always the involving-law-enforcement sort. I will have to set aside some time to finally get to this one. I just know I'm going to love it. Enjoy the rest of her backlist! I hope you love it as much as I did Christine! Thank you! I want to delve into them all now haha! But I'm pacing myself as I know I'll enjoy them more with the reading experiences being spaced out. I'm definitely going to read The Forgotten Garden next. Glad you liked this one. It is the only one by her that I have not read, but I do own it! I hope you enjoy this title, as and when you do read it. I want to read Kate H but I am unable to choose which one to go for. This is one of my choices. Great review. I originally planned to read Kate Morton's books in publication order, but then I picked this one up on a whim and couldn't resist it. I absolutely loved it though, and would definitely recommend. Thank you! I loved this one too! Wouldn't you love the chance to wander around the house? This is only the 2nd Kate Morton book I've read but I'm really looking forward to reading more. YES! To all of this comment. Haha! I hope you enjoy future books by Kate Morton.